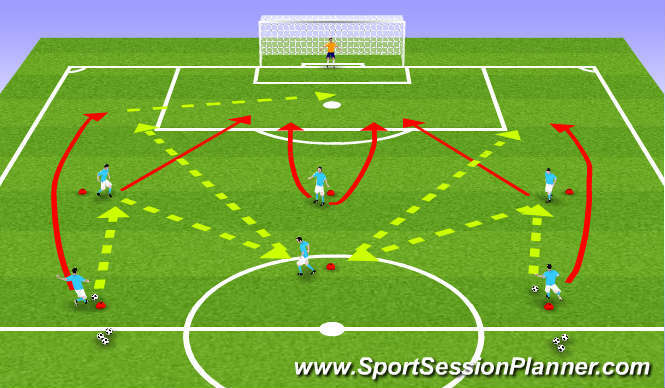 Set Up: Half field with goal. Three cones 25-30 yards out from goal representing strikers, one cone at bottom of center circle for ACM, and two cones 40 yards out representing outside backs. Balls with outside backs. Activity: Outside back plays ball up to outside striker, who plays ball one touch to ACM. ACM plays ball using 1 or 2 touch diagonally to outside back who is overlapping outside striker immediately after passing initial ball. Outside striker must sprint to front post for cross, and PS peels off away from outside back for back post run. Switch sides. Progress to using defenders where ball must be played by defender to outside back to transition and simulate game. Coaching Points: Passes must lead player receiving ball towards their target pass, weight of the through ball to overlapping defender, quickness of passes and movement to off balance defenders, quality of cross.